Niles, IL--The 2010 touring season has been a busy one for rock icon Slash, who hit the road for tours of Europe, Asia, and the U.S. in support of his eponymous solo album, which was released this past spring. Slash, which has reached #3 on the Billboard 200 and #1 on its Rock, Hard Rock, and Independent album charts, features a variety of guest vocalists. After a successful world tour through Asia and Europe in support of the album, Slash began his highly anticipated U.S. dates in August. Of course, Slash is best known for his distinctive guitar tone. Like many guitarists, Slash sticks with the tools that helped him make his name, maintaining a hardwired connection to his custom Marshall rig, which is miked with a pair of Shure ribbon microphones. “The KSM313 is very sonically neutral,” says Carlo. “What I like about these mics is that they sound like the guitar. It allows me to replicate the tone of Slash’s cabinets with virtually no EQ, typically just hi- and lo-pass filters. We’re using the front side of the 313 for the fuller, warmer sound.” The band’s other two guitars are miked with Shure’s SM27 condenser mics on the cabinets. In the final mix, all guitar mics are combined with a Palmer PDI-09 direct box. 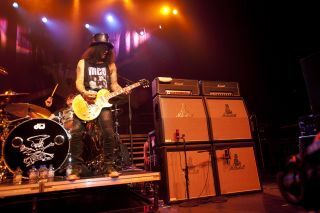 Lead vocals for Slash’s touring band are handled by Myles Kennedy, who uses a Shure UHF-R wireless system with Beta 58A capsule. Backing vocals are hardwired SM58s. The only other wireless systems in use on stage are a pair of PSM 900 personal monitors, used by Kennedy and bassist Todd Kerns. Monitor mixer Monty Carlo and guitar tech Chet Huan wear them as well.